This 6 x 8 Waltons Tongue and Groove Apex Garden Shed With Front Windows is high quality garden building that provides storage and can make a fantastic workspace. The double front facing windows provide a fantastic way for light to enter the shed.. A rim lock is supplied with the double doors to keep the wooden storage workshop secure. Constructed using 12mm tongue and groove cladding throughout, this wooden garden shed is a durable building. The strong interlocking design of tongue and groove cladding offers great strength to the build and is ideal for storing heavier gardening items. This style of cladding prevents water ingress, creating a weatherproof garden workshop. Thick 2" x 1" internal framing is used to ensure a strong, durable build. The opening window is glazed with shatterproof styrene, a much safer alternative to traditional glass. To offer further protection from weather damage, this timber workshop is supplied with a quality mineral roof felt. Complete with a ten year anti rot guarantee, you can be sure that this shed is a secure and long lasting garden building. The traditional apex design will look great in any style of garden and helps to prevent the build-up of rain water, offering further protection against wood rot. Our Reply:Good morningThank you for contacting us today. I am sorry that the panels did not fit through your house, the website does show the panels in the diagrams and a video to enable customers to see the size of each panel and sheds of this size. Review:Windows aren't particularly secure and really only decorative, at best. Standard floor is bouncy too and had to be strengthened by buying extra wood. It is great to know that you are happy with the quality and appearance of your tongue and groove shed. Thank you again for your positive feedback. Review:Good value for a cheap shed. However one of the windows was too big to fit the hole , so the frame had to be planed. Looks lovely painted slate grey. Thank you for your kind feedback, we look forward to doing business with you again! Review:Ok though not what I originally wanted. I am pleased that you are happy with your tongue and groove shed and if there are any outstanding queries we can help with, please contact us on either 0800 029 1000 or service@waltons.co.uk. Thank you again for your positive feedback. It is wonderful to know that you are happy with the quality of your tongue and groove shed as well as the service and I thank you again for your positive feedback. Review:The shed overall, as a finished item, is excellent. My only reservation is that not enough roof tacks were supplied and some screws were missing. Review:It's a really roomy shed with lots of height and the opening windows make sure you can have lots of ventilation. I am glad you are pleased with the quality of your tongue and groove shed and how spacious it is. Thank you again for your great feedback. 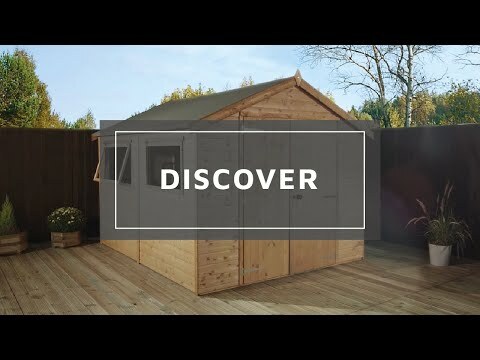 Review:This shed was described as groundsman quality and whilst overall it was reasonably well made the door opening on mine was not square so I had to remove material from the top of the door with a hand plane to get an acceptable fit. Our Reply:I am pleased to know that you are happy with the value for money of your tongue and groove shed and you are happy with it's appearance. Thank you for taking the time to offer your feedback, it is much appreciated! Review:Exact replacement of previous model, which has lasted me 27 years. Our Reply:I am pleased to know that you are happy with your tongue and groove shed and I thank you again for your positive feedback! Review:appears to be of good quality so far although i thought i bought a no maintenance product but have found i will have to protect it every year. Our Reply:I'm glad with you're happy with your shed, and we take your comments on board, thank you again. Review:Great shed, easy to assemble. Our Reply:It is great that you are pleased with your shed. Our Reply:We will take all of your comments on board and I am glad that you are pleased overall. Should you have any concerns please contact us at service@waltons.co.uk.